BRYAN EATON/Staff photo. 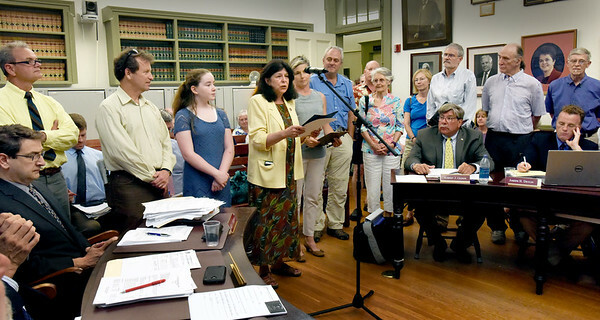 Newburyport mayor Donna Holaday presented a resolution Monday night, at the city council meeting, stating that the city joins with the United States Climate Mayors to honor the Paris Climate Agreement. Organizations standing with her were Newburyport Energy Advisory Committee, Clean Tech Center, Eco Collaborative, Storm Surge, Union of Concerned Scientists, Nock Middle School, Newburyport High School, Joppa Flats Education Center, Transition Newburyport, Hall and Moskow, Friends of Newburyport Trees, First Religious Society Church and Gulf of Maine Institute.